Japanese filmmaker Sono Sion made a lot of movies in 2015. Before the year was up, Sono had no less than six films on cinema screens around the world at festivals and back home in Japan. So far the only one to get any kind of proper release in the English speaking world, though, is his musical kaiju fantasy Love & Peace, and it is really something special. The film revolves around a quirky cast of characters led by Hasegawa Hiroki (the exuberant lead from Why Don't You Play in Hell?) as Suzuki Ryoichi. Ryo is a salaryman working at a music parts distributor who dreams of rock stardom. Unfortunately for him, he's very shy and has no social skills at all. When he adopts a baby turtle at his lowest emotional point, it becomes the impetus for a newfound enthusiasm for life and his buddy, named Pikadon (the Japanese diminutive for the A-Bomb), seems to love him just as much. One day when his secret joy is discovered by his cruel and petty workmates, Ryo abandons Pikadon in an instantly regretted attempt to regain his masculinity. However, this rash decision backfires and he immediately suffers a complete emotional shutdown. However, as sometimes happens in the movies, strange events begin to occur and the story of Pikadon and Ryo is far from over. The show of Love & Peace is that it's both coherent, entertaining, and still contains much of what his darkest genre fans like about his work. It's a superficially silly film that you could show your kids, but it remains more dark and insane than anything else they've likely seen from any other filmmaker. 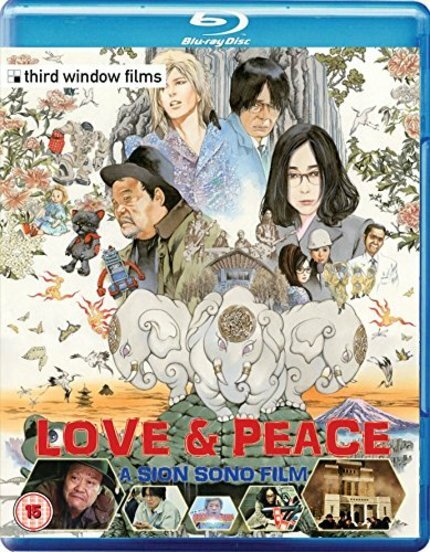 I loved Love & Peace, and think it may well be Sono's most unabashedly entertaining, and thus perhaps his most successful film. It's ambitious and silly, perfectly blending the surreal with the saccharine to create something that's simply a joy to watch. While I don't often agree with Mr. Gorber, in this case it's hard to argue. Love & Peace is somehow vintage Sono in its obsessions, the level of creativity, and the amped up level of energy involved in the production. The surprise is that the film is also completely SFW, unlike Sono's most notorious work. I don't think I've smiled quite as consistently and earnestly at a film so far this year. As the father in a kaiju obsessed family, I cannot wait to show this film to my own son, who knows more about Godzilla than I ever will. Love & Peace shows a side of Sono that we kind of knew was there. In films like Himizu and Land of Hope, Sono's optimism has been given voice with varying levels of success; however, those films nearly drown in their own overwrought earnestness. In between the melodrama, though, there are moments of shining joy in each, and in Love & Peace Sono manages to successsfully string together an entire film packed with those moments and it is a thing of beauty. Love & Peace is presented on Blu-ray by Third Window Films in a pristine presentation that has no technical faults that I was able to see. I see no real reason to harp on about A/V details when the thing is perfect. Color is great, detail and clarity are great, and the surround DTS-HD audio track is quite good with decent separation. There are only two extras on the disc, but I was more than satisfied with what Third Window presented. One of the extras is the trailer, which is no big deal, but the other extra is a little bit of a spoiler (if you ask me), so I'll try to describe it without giving away too much. There is a 25 minute featurette that follows the FX creation for a couple of crucial scenes in the film. We get to see Sono's FX shop planning, building, and executing some amazing miniature and tokusatsu work for Love & Peace. Honestly, the main reason I enjoyed it as much as I did was that it allowed me to live inside the world of Love & Peace for another half hour, and that was a great thing to be able to do when the film ended. Definitely a lot of fun and worthwhile for tokusatsu fans. Love & Peace is adorable, and not in a grating or overly saccharine way. I have never involuntarily "aw"ed at a movie the way I did with this one, it's just a sweet story told with style. That's not to say that Sono's trademark misanthropy isn't present, it just isn't the focus of the film, and that's a nice switch. I can't recommend this highly enough. Love & Peace is now available on Region B Blu-ray in the UK from Third Window Films. This movie is very very good. Me and my wife watched this last week. Loved it!